The Nightmare Before Christmas is a musical fantasy film produced by Tim Burton. The hero, Jack Skellington, is the pumpkin king of Halloween Town. One day he stumbles into Christmas Town, and is so taken with the idea of Christmas that he tries to get the resident bats, ghouls, and goblins of Halloween town to help him put on Christmas instead of Halloween. The Deluxe Jack Skellington Fancy Dress Costume includes a thin black jacket with white pin stripes, collar and jagged finish tails and faux button with Velcro closure. With the jacket is a bib style white faux shirt front, which ties around the neck and is tucked in to the jacket to create an under shirt look. The rubber padded bat bow tie has elasticated ties and an inner wire so the tie can be shaped. Completing this deluxe costume is a full overhead vinyl mask with nose and mouth holes and netted eyes so you can see out but no-one can see in. This is a one size costume suitable for jacket / chest size 42" to 46" and costs £41.99 online. 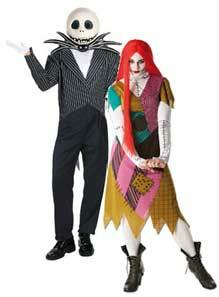 And you / your other half can be there to stop the madness in a Sally Halloween Costume. This outfit includes a multicoloured printed patchwork dress, long glovelets with printed stitching and a long red wig. It comes in three sizes - small (8-10), medium (12-14) and large (16-18) and is for sale online for £31.49.